Before going to see Crazy Heart, I had read a mini-review in which it was referred to as “The Wrestler meets Country and Western,” which gave me a slight feeling of dread. With a lesser actor than Jeff Bridges, I may well have skipped it. Who needs to see another tale of slow agonizing decline and death? Mickey Rourke already did it about as perfectly as can be done. 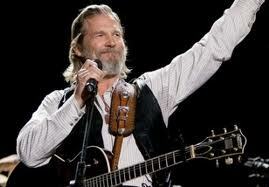 But I’ve been a Jeff Bridges fan for a long, long time. And, of course, the opportunity to see him do a Country and Western crooner was not to be missed. So I went, and I watched, and I couldn’t help noting all the Wrestler parallels. The down and out legend, the reverent fans, the alluring woman who is also a mother, the waking up alone in a hospital bed, the ominous warning from a doctor, the attempt to reconcile with an alienated child, the eventual loss of the woman. At a certain point, however, to my relief, I knew that this story would have a different ending. There was a little less loneliness in it. A little more hope. He, at least, had an agent on his side, and a protégé-made-good who wanted to work together again. And the woman he wanted was interested in him, too. See, a story of addiction has an inherent narrative limitation in that there are only two possible endings – the substance abuser either hits bottom and gets better or . . . he dies. Because addiction is a disease and it is the nature of disease that you either get better or you die. Hopefully, you get better. But that’s not all. There is another narrative limitation to a story of addiction. Because it is a disease, it has only one course of progression. Like when you get chicken pox – first you get a fever, then you feel fluish, then little red dots appear, then they itch, then you think you’ll go insane, then the blisters burst and scab over and then you get better. This is how it goes in everyone. So with addiction – first the substance is used socially, then recreationally, then compulsively, then obsessively, then exclusively and then disastrously. The individual in its grip goes down, down, down, losing friends, family, job, school, home until, finally, either the body succumbs or the consciousness is jolted back to life. This is why I have always cautioned students and clients against writing a story of addiction. There is too great a risk that it will come across as generic. In fact, the desire to tell the gut-wrenching truth about the disease of addiction is almost at odds with the desire to portray individual character growth. The whole point is that it’s not about the individual. It’s about the disease, which is the same for everyone. The underlying character isn’t going to get anywhere until the addiction is gotten past. So we end up with a well-intentioned but bland film that reads more like a textbook description of a diagnosis than an individual human drama. Thus, my sinking feeling in the middle of Crazy Heart. But I hung in with it. And, once again, my old pal Jeff did not disappoint. I didn’t leave the theater with that feeling of having been fed an over-responsible and earnest portrayal of a syndrome. I left feeling that I’d witnessed a genuine human struggle. How did the film do that? First, some history of addiction stories. We do have a literary precedent for the addiction story as tragedy in Long Days Journey Into Night, suggesting that the alcoholic/drug addict story can, indeed, be dramatically satisfying with the subject succumbing in the end. While the morphine-addicted Mary doesn’t die, there is little doubt left that she will never recover from her addiction and, thus, is certainly on a downward slide to her death. But in the process, an awful lot of truth is revealed about how a family can systematically destroy itself. No one had explored addiction so thoroughly before this play so it immediately became the standard bearer on the subject. And it gave little hope for recovery. But then, little was known at the time about the possibilities for recovery. In the 1980s, on the heels of Betty Ford’s recovery in 1978 and the founding of her rehab center in 1982, addiction recovery hit the media. But it had a lot to live down – Bowery bums, ghetto drug pushers and the notion promulgated by the Temperance Movement that alcoholics must “reform.” Understandably, the Recovery Movement had to actively promote the disease model. An unfortunate side effect was a spate of well-intentioned Movie of the Week dramas full of generic characters. No doubt contributing to this tendency was the Alcoholics Anonymous ethic of anonymity, which tells those in recovery not only do they have the right to withhold their identity but they are also free to tell anyone who’s asking, “None of your god-damned business.” So . . . exactly whose story are we telling in this Movie of the Week about an alcoholic? None of your god-damned business! However, as Eugene O’Neill so effectively demonstrated, the best source of compelling, truth-telling drama is in very deep, ruthless mining of one’s own personal experience. Thus, for us, as dramatists, the preservation of anonymity and the mining of deep human truths, while not complete strangers to each other, are nonetheless unproductive bedfellows. They create generic babies. Crazy Heart didn’t have any generic babies in it. It very much left the feeling of having ruthlessly mined deep personal truth. But whose? Certainly, Jeff Bridges mined his own deep truth in coming up with that performance. But he can’t make it up out of thin air. It had to already be in the script. Who wrote this script anyhow? I prowled around the internet for information on book author Thomas Cobb and writer-director Scott Cooper, but I found no revelations of experience with addiction. Apparently, they’re subscribing to that none-of-your-god-damned-business stance. Too bad. So, if no one else is going to share, I’ll say a little something about an important lesson of storytelling I learned from my own experience grappling with addiction. Back in my late 20s, when I was coming to terms with my mother’s drinking, I went through a period of attending 12-step meetings. Every meeting began with one person in front of the room telling their story of growing up in an alcoholic family. I was, at first, pretty scared of telling my own story, but I found the stories of others riveting. It was in this context that I came to learn the truth of the phrase, “the more personal it is, the more universal it becomes.” I had, of course, heard it said many times while studying screenwriting in film school. But the meaning was abstract. Here, I saw people pour their guts out, in the most intimate and inimitable detail, and the rest of the room, far from nodding off in boredom or screaming in horror and running out the door, would simply nod and sigh knowingly. When it finally came my turn to be at the front of the room, my own story of growing up with refined John Cheever-like suburban tippling felt so lame compared to some of the high drama that headlined on other nights. But the gathered assembly simply nodded and sighed for me as knowingly as they did for everyone else. And a few thanked me later. From this I learned it didn’t matter what my story was, so long as it was my very personal and unique story. In a confounding paradox, the more specifically I told it, the more thoroughly they were able to see themselves in it. And the happy ending? Well, as with any happy ending, the degree to which we can accept it is directly related to the degree to which the character had to work for it along the way. And the amount of hell the character had to go through. So Bad Blake’s happy recovery is supported by how low – how very low – we saw him fall before he hit his own personal bottom with a resounding thud. But, of course, the ending of Crazy Heart isn’t entirely happy. I don’t want to spoil it for anyone, but he loses something big in the process of gaining his sobriety. This is what makes the story individual. That was the path he had to follow to get there. The universal part is the compulsion towards self-destructiveness. We have all felt that compulsion in ourselves at some point in our lives. Maybe we have acted on it. We have certainly feared our potential to act on it. That is what the film is expressing for us. Which brings me back to The Wrestler, in which self-destructiveness is not only a way of life, it’s a professional calling. Despite it’s literal title, The Wrestler is not a literal story. It’s a metaphor for a self-destructive path. Crazy Heart, on the other hand, despite it’s metaphoric title, is not. It is a literal chronicling of a very personal testimony. From somebody. I don’t know who.